The billboard is located in Richland County on US 30, MLK Expressway. 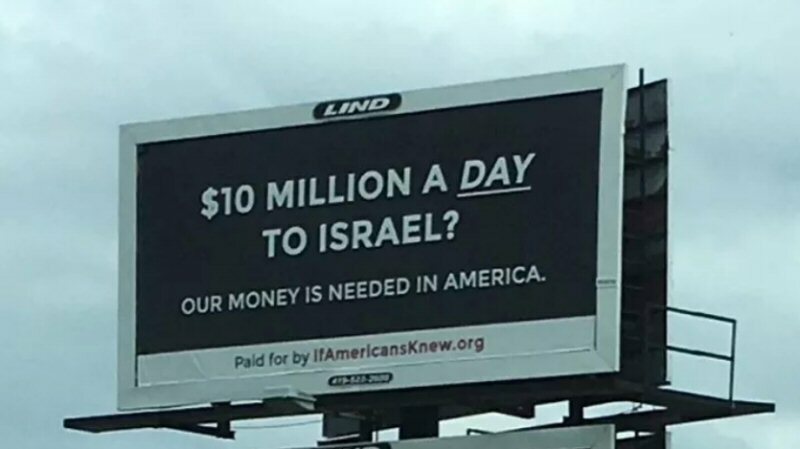 If Americans Knew erects billboards around the United States to tell Americans how much of their money goes to Israel,as U.S. media rarely reports this. For example, legislation before Congress, today, will give Israel $38 billion over the next 10 years – the largest military aid package in U.S. history – yet, no U.S. mainstream media have told Americans that this bill even exists. If Americans Knew is a nonpartisan, nonprofit American organization which provides information on Israel-Palestine to the American public, with particular emphasis on the U.S. connection. Concerned Americans around the country frequently help choose the locations and fundraise for the billboards. Israel partisans often try to pressure billboard companies into removing such billboards.